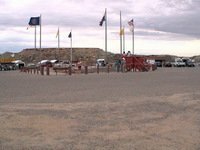 We were expecting the Four Corners National Monument to be a big tourist trap. You know, huge crowds, long lines, and completely overcommercialized. But as it turns out, the monument is in an out-of-the-way location and wasn't too crowded on the Monday morning on which we visited. Definitely a good road trip stop. The monument from a distance. We had no trouble getting close to the site. I don't know what it's like on weekends or major holidays, but I would advise you, based on our experience, to go on a quiet weekday so you can really enjoy the place. A closer view. Just walk up the steps, and you're right at the spot where four states meet. It almost seems too simple. 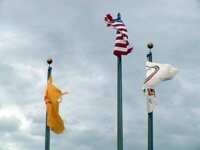 Four state flags and the U.S. flag fly over the monument. If you're traveling with school-aged children, quiz them on which flag is which. From there, you can go into state capitals, major cities, and other state trivia, turning your outing into a fun little lesson. It's a good way to keep your kids' minds sharp in the summer. You can stand right on the spot. There are ledges where your friends and family can take pictures of you standing in four states at once. Well, probably only two states, unless you're a four-legged animal. Again, going on a weekday meant we had plenty of time to cavort around the four states because there was really nobody in line. Many souvenir stands surround the monument, but they were mostly empty on this Monday. This is one drawback to going on a weekday. I'd imagine these booths are full of souvenir vendors on weekends. 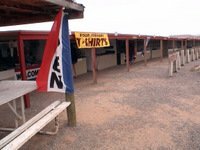 We really could have used some Navajo Fry Bread, but the booth was closed. 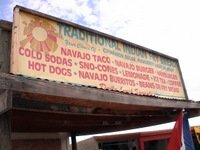 Have you tried the Navajo Fry Bread? Why not? It's delicious - not quite sweet and not quite savory. If you're in the Southwest and see it on a menu, order it. You won't be sorry. Many southwestern gift shops also carry bake-at-home Navajo Fry Bread kits, which I'm sure are quite enjoyable. 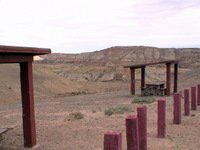 Beyond the booths and wooden pegs of the monument, there's nothing but wide open land. It's a good reminder of how much wide-open land there really is in this great country of ours. 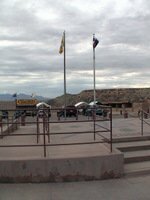 All in all, the Four Corners National Monument is worth a trip. There's not really that much to see or do, but the spot has an endearing novelty to it...and the drive to and from the monument is gorgeous and a bit cathartic.